Ok, it seems like there's little knowledge about this tape. As you all know Biggie was supposed to release "Ready To Die" on uptown records, but Biggie's mentor Puff Daddy was fired, way before Biggie and Puffy could finish the album. When Puffy left (or better said was "forced to leave") he took all of the then unreleased Biggie tracks with him to his new formed record label Bad Boy, Biggie of course followed and the rest is history but some of the Ready To Die tracks were already done under the Uptown umbrella. 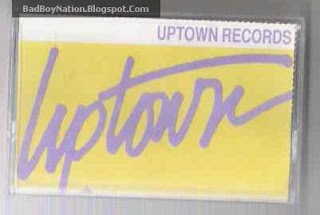 In 1993 right before Puffy took off Uptown compiled this promo tape (with Puffy's blessing) to demonstrate the skills of their new artist and to ad the upcoming then untitled debut album by Biggie. 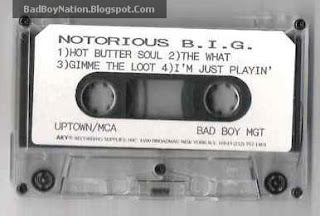 Ironically at that time Bad Boy Management existed before Bad Boy Records was formed, that's why it has the "Bad Boy Bgt" writings on the tape (at the bottom to the right). To my knowledge less than 100 of these tape were made, which were not for sale but for local radio stations and djs. After Puffy left Uptown he was not very pleased with this tape spreading into the streets and he at some point threatened local djs to cut their relationship if they play this tape publically. why? it would give away to many secrets of his new project. This tape is definately hip hop history! Side A and Side B are the same. Why titled "hot butter soul"? first the song was untitled at that time and secondly "warning" uses samples of "walk on by" from isaac hayes` hit album "hot buttered soul"
I honestly can’t tell the difference between this one and the released one, although my counter tells me that the original is four seconds shorter. Thanks to Kinetic at NotoriousOnline.Org for the tape info.